I can’t think of many foods that offer the versatility and flavor potency of a freshly picked, unsprayed, wax free, organic lemon. Unfortunately, I can’t think of many foods that are more difficult to find most of the year, either! Sure, tired looking lemons coated in shiny, slightly sticky wax can be rescued from the corners of the produce section at any time, but really, who wants those? This recipe will help you elevate your kitchen into the realm of Great Cooks, by helping you make the most of culinary gems such as crazy-fresh lemons whenever you can find them. Moroccan cooks have long known that lemons need only a little help in retaining their magnificent flavor. By stuffing lemons into jars, layering them with salt, allowing them to bathe in their own juice and a few spices, Moroccans have mastered the alluring art of preserving lemons. Months later, silky pieces of preserved lemon can simply be rinsed off with water, chopped, and added to any dish needing a citrus punch. In North African kitchens, these dishes might include couscous or tabouleh. In your own kitchen, the sky’s the limit – try preserved lemons in a marinade, a vinaigrette, or a pasta salad. 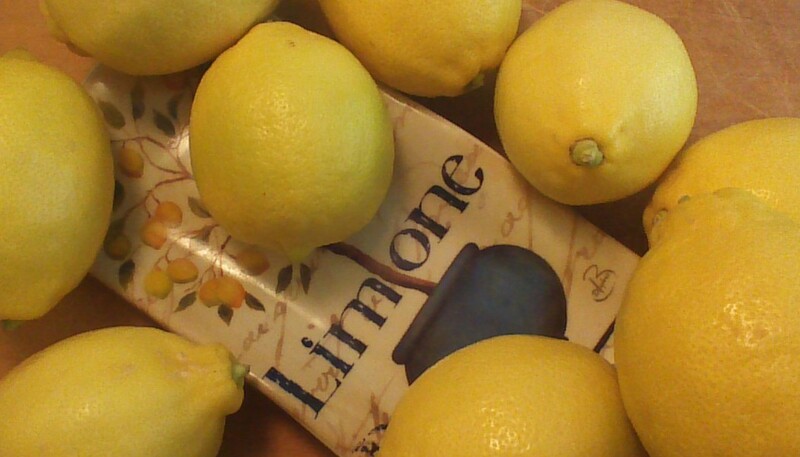 Let me know how these lemons inspire you, and how your meal turns out! Step 1) Wash lemons really, really well. Trim ends, and cut lemons into chunks. You can simply cut the lemons in half, or cut them into smaller pieces, whichever you prefer. I cut my lemons into about 16 pieces each, because l want to just “rinse and add” bite-size pieces when I use these lemons in recipes later on. Step 2) Stuff your lemons into sterilized canning jars. Don’t be gentle… you want the lemons to soak in their own juice! 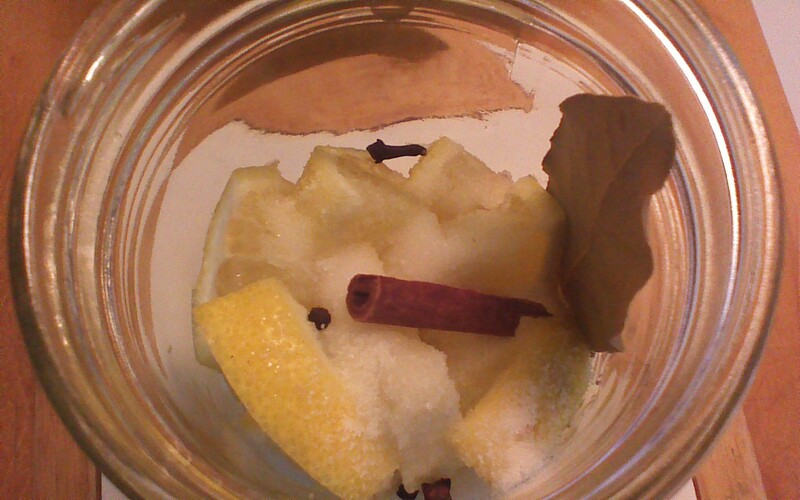 Step 3) As you fill the jars, sprinkle the lemon layers with salt and add your spices. Each jar should end up with 1/4 cup of salt (a little more is fine, but don’t use less). Step 4) It is important that your lemons are covered in juice. If they are not, add juice from additional lemons, until the jars are full. Leave 1/2 inch headspace. Step 5) If you are canning your lemons for long-term storage, cover with lids and bands and process in a boiling water bath for 10 minutes. Properly sealed jars will last a year or longer on a pantry shelf. Alternately, simply place your covered (but unsealed) jars in the refrigerator, where they will stay fresh for 3 months or longer. 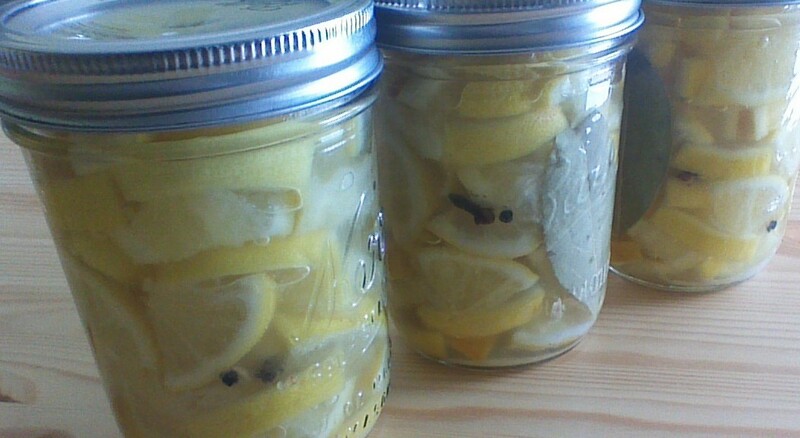 Step 6) Be patient… your preserved lemons will be ready to enjoy after 1 month! Don’t forget to rinse before using. This entry was posted in Canning and Preserving, Fruits and Veggies and tagged Food, Lemons, Morocco. Bookmark the permalink.